Comcast Cable is one of the nation’s largest video, high-speed internet, and phone providers to residential customers under the XFINITY brand, and also provides these services to businesses. It also provides wireless and security and automation services to residential customers under the XFINITY brand. Its Florida Region is the largest in the company in terms of number of subscribers. Hurricane Irma may have left major damage when it swept across the Atlantic in 2017, but a year later a group of dedicated volunteers was busy replanting the trees and vegetation that had been destroyed at places like Sweetwater Elementary School in Miami, Florida. This was just one of many “good news” stories that came out of Comcast Cares Day, the company’s annual day of service that celebrated the participation of its one millionth volunteer in 2018. 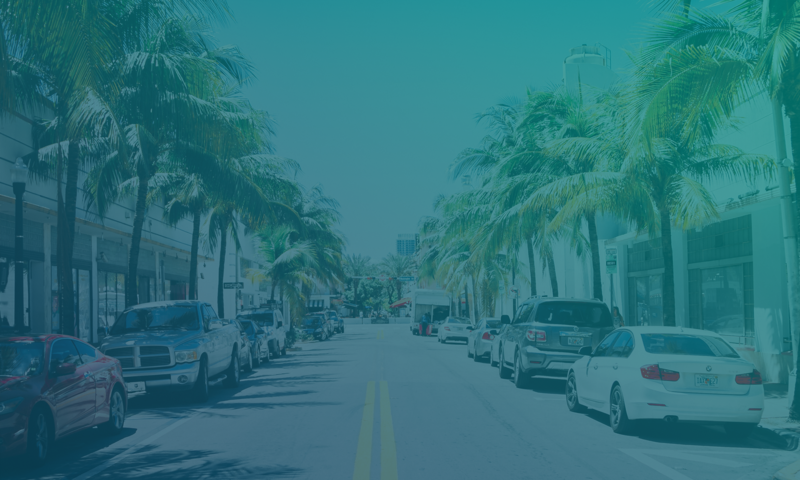 It’s the kind of initiative that makes for positive earned media coverage, which the Comcast Florida Region Public Relations team maximizes by making strategic use of the media database, distribution and monitoring capabilities of Cision Communications Cloud®, along with Cision Impact. 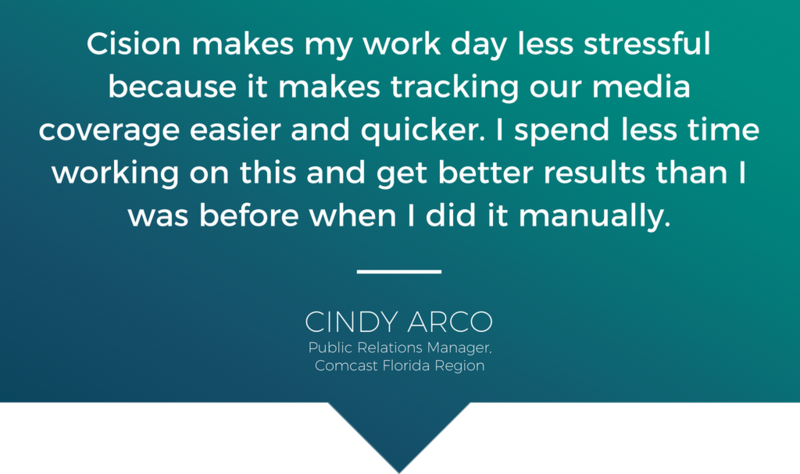 Cindy Arco, Public Relations Manager for the Comcast Florida Region, is based in Jacksonville, Florida and works together with her boss, the Vice President of Public Relations, who is based in West Palm Beach. Together they are responsible for external communications duties for Comcast’s markets across Florida. That means juggling a lot of things at once -- not all of which contribute to increasing earned media coverage. When it comes time to pitch media, Arco says the challenges facing many newsrooms at newspapers and television stations have had an impact on communications professionals as well. 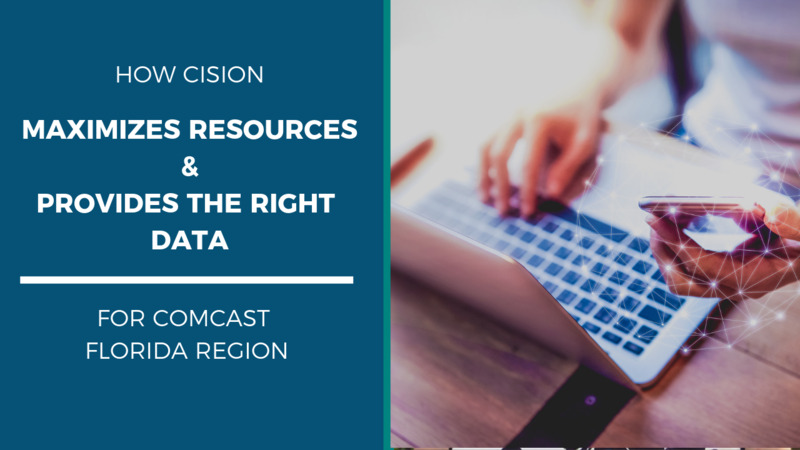 Comcast makes full-use of Cision Comms Cloud’s database, distribution, monitoring and analytics capabilities. With more than 1.6 million contacts in the Cision Database, Arco instantly gains access to complete, dynamic and vetted influencer profiles. She can then reach targeted audiences using Cision Distribution by PR Newswire, the industry leader with the largest and most comprehensive distribution network, which can be accessed directly within Cision Comms Cloud. Throughout the campaign process, Comcast employs Cision multi-channel monitoring and analytical tools to retrieve holistic media coverage, attribute value, and gain credibility with internal and external stakeholders. Comcast also uses Cision Impact, a product that makes it easy for communications professionals to demonstrate the return on investment for their earned media results. Cision Impact uses a Cision ID to track things like the reach of a story, engagement such as click-throughs and conversion data such as shopping cart activity or lead generation. 25% Time Savings: Tracking the clips where Comcast gets coverage isn’t something Arco can ignore, no matter how busy she gets. 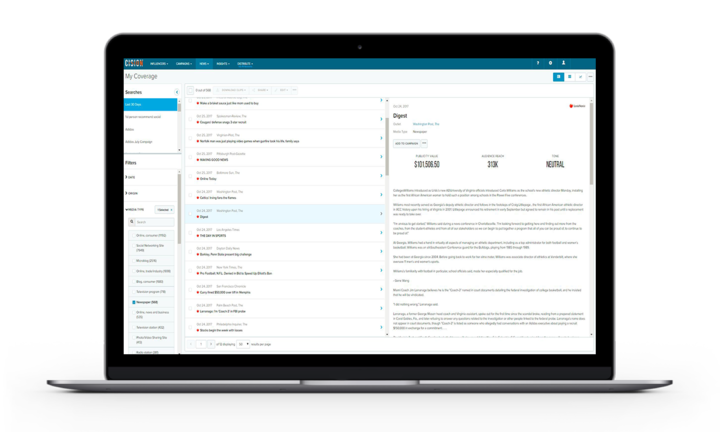 Omni-Channel Monitoring Capabilities: Arco says she previously used Google Alerts to keep her eye on mentions of Comcast in the news, but that has its limitations. Customized Queries to Build Lists: “It’s tough to have good connections with news media in every single market. It’s just not realistic,” Arco says. Using Cision Comms Cloud means Arco can seek out influencers based on their area of focus, items on a publication’s editorial calendar and more. A Trusted Advisor Relationship and Personalized Service: Arco gives high marks to the Cision team, particularly her account manager, who keeps her updated on new features and training opportunities. Arco is looking forward to using Cision Impact as a way to demonstrate the business value of her earned media efforts.